But then – Christ arose! A miracle of miracles occurred! There came the day of which in deep antiquity King David sang; “This day which the Lord has made, let us rejoice in it!” And the Church joyfully proclaims: “Now all is filled with light: the heavens, and the earth, and the netherworld; let all creation celebrate Christ’s resurrection, in which it is affirmed”… The feast of feasts and the triumph of triumphs! The Holy Gospel tells us that the first word which the Lord said to the myrrh-bearing women who saw Him after His resurrection was an appeal to joy: “Rejoice!” – He told them, and bright joy filled their souls. But He also knew what sorrow and grief had taken hold of those whom in His love and compassion He had called His brothers – His beloved disciples. And thus, on this very day of His resurrection, He appears to them as they are gathered together. “And the disciples rejoiced, seeing the Lord,” – notes St. Evangelist John. What the Saviour had prophesied to the apostles at the Mystic Supper now came to pass – their souls were filled with the joy of His resurrection. Now no one could take away this joy from them, and they spread this joy to all of mankind. For in their preaching they primarily stressed the fact that they were witnesses to His resurrection, and the book of the Acts of the Apostles specifically points out that the apostles testified to the resurrection of our Lord Jesus Christ with great power. 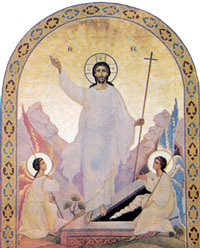 To this joy of Christ’s resurrection the Holy Church also summons all of us by saying: “Come, let us rejoice in the Lord who had destroyed the dominion of death”… Before Christ’s resurrection the “dominion of death” was indestructible – death lorded it over all living beings, and had the last word in regard to every living being by terminating its life. But the resurrected Christ trampled down death by death, destroyed its power, shattered the dominion of death, and now for every Christian believer death is only “eternal rest in blessed dormition” or, according to St. Basil the Great, “a passage from sorrow to that which is beneficial, sweet, comforting, and joyous.” This is what the Conqueror of hell and death granted to us through His resurrection. Come then – let us rejoice in the Lord! And let nothing darken or take away from us the joy of the bright feast, of the great triumph of our faith, which is “the victory that overcometh the world” (1 John 5:4). Let dark clouds gather over the world. Let life become more disturbing and tense, and let our planet become like a powder keg thanks to the latest technological discoveries, ready to blow up any minute and destroy all existence. Let the world, which is getting farther and farther away from God and His truth proceed to its inevitable and inescapable end. “He that is unjust, let him be unjust still; and he which is filthy, let him be filthy still; and he that is righteous, let him be righteous still; and he that is holy, let him be holy still. And, behold, I come quickly, and My reward is with Me, to give every man according to his work shall be” – says to us the Conqueror of death and hell (Apoc. 22:11-12). Before embarking upon His mankind-saving endeavor, Christ warned His disciples, and through them all of us who believe in Him: “In the world ye shall have tribulation, but be of good cheer: I have overcome the world” (John 16:33). He makes everyone who truly believes in Him a participant in this victory. And this victory is the victory of His Resurrection, the victory of life over death, of good over evil, of light over darkness. Let each faithful soul see Him, the Master of life and the Conqueror of death, through the eyes of faith, and let it rejoice with the triumphant joy of His Resurrection – and this joy no man will take away from it for ages unto ages!